A four CAN channel vehicle network interface for network development. A versatile low-cost vehicle network interface for network development. If you work with multiple CAN channels in your development work, The NetbriDGe offers the lowest cost per channel on the market today! The best value in CAN pass-thru device hardware. Use it for validation, network development, and test fixture to module network communication. Also a great tool for End-of-Line testing and using your own software for ECU and network prototypes. It is compatible with all of today’s industry standards. 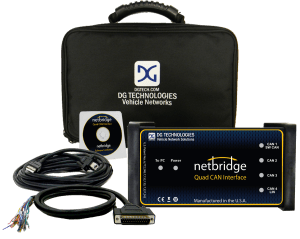 The netbridge provides standards-based engineering and development vehicle applications for EOL Testing and ECU prototyping by sending/receiving messages over the data bus to communicate with a device under test, a vehicle network, or test fixture using an open-ended 25 pin DB cable–making it the perfect CAN & LIN tool for engineers who prefer to write their own software. Industry Best 2 Year Warranty!